Meet Thomas Banks, he is 24, gay and single - but hopefully not for too long. He also lives with cerebral palsy. 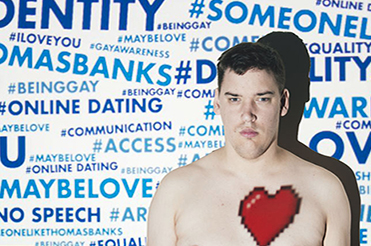 Beginning as a short piece in 2010 that has since been developed to this full length and predominantly one-man show, Someone Like Thomas Banks focuses on Bank’s own experiences with online dating, hook ups and not only discovering his own voice and identity but holding on to it. Banks uses a variety of cleverly executed multimedia tools to share his story, such as projected text, a Lightwriter, animation, social media and pre-filmed segments. The projections of closing doors throughout the show speak volumes as to the rejection that Banks faces in his want for love. At another point, an audience member reads out Banks’ experience of being bullied as a student on the school bus. As this is happening (and in relation to the story), Banks augments the narrative by walking around the stage dropping coins on the floor clearly showing his resilience and determined nature. Banks depicts a number of relationships to show the various sides of his personality. Scenes with his psychologist provide the opportunity for Banks to share intimate moments of his life, while the conversations with his mother show his vulnerability and loving nature. Despite the story being a little repetitious during the first half of the show, its use of different media and contexts prevent the audience from ever feeling the pace is slowing down. Bank's personable nature and outgoing manner shine throughout, especially when he greets each of the audience "volunteers" with a hug and a selfie. However, when he delves into darker territory, and sometimes unexpectedly so, our instinct is to dwell on that and wonder how he overcame such adversity. Banks chooses not to focus on these stories any longer than necessary though, and moves on to better things, as if to emphasise bad things do and will continue happen, but these moments only define us if we let them. Someone Like Thomas Banks is not about a gay man living with a disability looking for love. It is a story about a person looking for love, to connect with other people. It is a well-crafted and appealing story to remind us to enjoy the life we have, to take chances and have fun with everything we do. We should all be fortunate enough to have the outlook in life of someone like Thomas Banks.